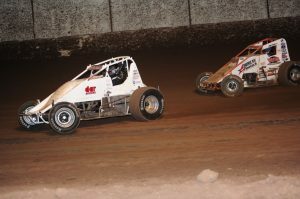 This Saturday night June 9 will be the final time to catch the USAC Sprint Car Series in action at the speedway until fall as we wrap up the 2018 spring portion of non wing sprint car shows at Arizona Speedway. R.J. Johnson picked up the last win at the speedway followed by Mike Martin and previous race winner Tye Mihocko. Johnson has 2 USAC victories at the speedway in 2018, Mihocko holds one. Charles Davis Jr. comes into Saturday nights meet holding a 86 point advantage over Mihocko who hold a 22 pioint lead over Mike Martin in third. IMCA Modifieds, IMCA Sport Mods and Pure stocks also on hand. With eight points races in the books seven different drivers have stood in the San Tan Ford victory lane in the Arizona Speedway Modified division with Tyler Mecl being the only two time feature winner on the season. Drivers also with wins on the season, points leader and latest winner Chaz Baca Jr, Jeremy Thornton, Rob Colclasure, Zachary Madrid, RC Whitwell and Joey Moriarty showing the close competition of this division coming into Saturday night. Hunter Marriott and Jake O’Neal also picked up wins during the mod tour pushing the tally to nine different winners in ten features. Sport Mods boasting record growth in 2018 will rebound on the card and currently have Chase Alves leading the division 16 points ahead of Mark Harrison who lead Jason George by 4 points in third. Pure stocks wrap up the card and show Larry Brigner holding onto a 4 point lead over Kevin Parker in second and Darryn Werkmeister in third 13 points out of the lead. Brigner has 4 wins on the season. Action begins at 7:45pm Saturday with grandstands opening at 5:30pm and pits opening at 4:30pm. Cost of admission just $15 for all adults, $12 seniors, kids 11 and under are free. Pit passes $35 , kids 7-11 pit passes $15 and kids 6 and under free. Arizona Speedway is located within ET Motopark at 48700 N Ironwood Dr. San Tan Valley, AZ 85140 5 miles south of US60 on Ironwood Dr. Call the hotline or logon to www.ArizonaSpeedway.net for more info. 480-926-6688 . Follow us at www.Facebook.com/ArizonaSpeedway .